Kwasi Enin’s essay about his love for playing music played a significant role in gaining him entrance to eight of the top Ivy League universities last week. His story made headlines, sparking numerous online debates and inspiring many to examine music all the more readily as a means of bolstering our understanding of literature, science, math, and — most importantly — ourselves. Kwasi, who will be enrolling as a pre-med student, teaches us that you don’t have to have aspirations of becoming a professional musician to reap the benefits of a music education. Below, I’ll share several reasons why every college-bound student, no matter his/her intellectual passions, would benefit immensely from a firm musical foundation. In short, divergent thinking is a necessary capacity for creativity — it’s the ability to find multiple solutions to a problem, think of all the ways something can be done, and explore infinite possibilities. Conversely, convergent thinking is the ability to synthesize information and arrive at the best answer from a set of finite possibilities. While the majority of education teaches us to think convergently (e.g. SAT exams, IQ tests, and math repetition), we must find balance in providing students with ample opportunities to develop their divergent thinking. Learning to interpret music and play it in a way that resonates with us personally both serve as wonderful practices in divergent thinking. Furthermore, writing music and improvising are some of the most effective and fun ways to practice this skill. The most rewarding aspects of learning an instrument, which span far beyond mastering the fundamentals, include having a strong understanding of the theory behind what you’re playing and feeling liberated enough as to let your expression flow freely in the form of a spontaneous riff or original composition. Anatomy, Physics, Neurology, Psychology, Fractions, Ratios, and so many more mathematical and scientific concepts can be explored through the lens of music. How sound waves travel, how our body, mind and spirit participate in the making and listening of music, how our brains respond to music–affecting our moods and behaviors–and how music is broken into precise mathematical patterns are some of the ways in which the phenomenon of music lends itself to exploration. A skilled music educator will help students make these meaningful connections, enabling the students to apply what they are learning in the classroom and solidify it all the more through the real life experience of making music. Enjoying music is something all humans have in common. While we may not all agree on what genre of music we find most appealing, few can deny the feeling one gets when listening to a favorite tune. Music serves as a gateway to studying different cultures, because the music of any region very often reflects the political, social, and philosophical realities of that place and time in history. Consider the political roots of American Rap music in the late 80s and Futurist composers in Fascist Italy. Through simply studying musical productions from those various points in history, we can synthesize enormous amounts of information about the social climates in which the musicians existed. Additionally, music invites diverse people to connect on common ground. Through finding ways in which we are the same, students can be coached into becoming more empathetic and developing a more integral understanding of and responsibility to those with whom they share the world. 4. Music teaches us grit and mindfulness — and boosts self esteem! Anyone who has ever learned to play an instrument knows it is not an easy endeavor. Learning the language of music, while challenging, provides an immense opportunity for students to develop grit and discipline. Students who are exposed to music early in life, and who learn to practice diligently, will likely carry that self discipline into their adult lives. Moreover, playing music is one of the easiest ways to practice getting into a state of “flow,” or what Mihaly Csikszentmihalyi explains as a mental state of productivity in which a person is completely immersed and focused upon the task at hand. 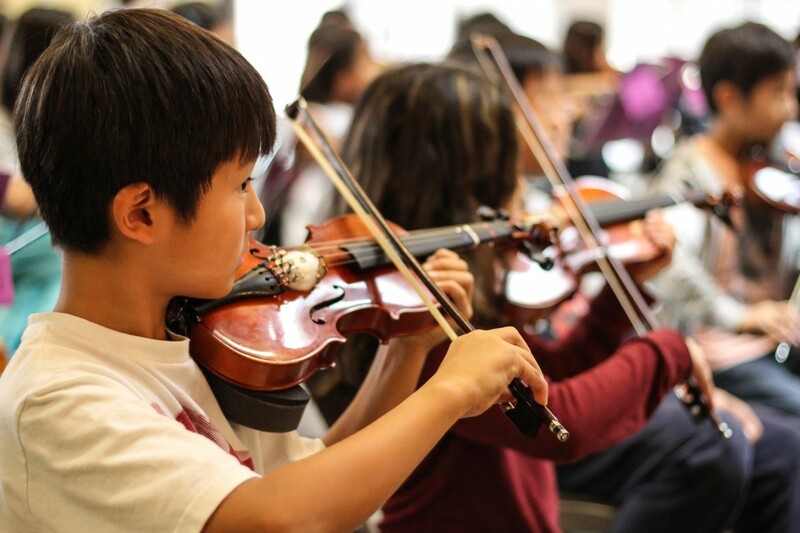 A musical practice regimen, if followed diligently, can teach students not only the benefits of tenacity, but can also provide them with an understanding of mindfulness and a daily opportunity to connect more deeply to their inner worlds. Finally, the fulfillment we get from conquering the difficulties that music presents and overcoming bite-sized challenges in daily practice consistently, boosts self esteem and teaches students that they can accomplish anything to which they put their minds! While many have heard of the believed benefits of listening to Classical music while reading, music can make us better students in some unexpected ways. Music is simply mathematical patterns of sound and rhythm. One of the biggest intellectual benefits of studying music is the ability to identify and recreate these patterns effortlessly through practice. Developing a keen sense of rhythm will not only help students feel more confident on the dance floor, but it can also help them take advantage of creative studying techniques that are predicated upon pattern and repetition. We all use music to learn — the ABCs are a rap — and those who truly understand this can tap into their well-developed musical sensibilities to help them remember vast amounts of information for exams and presentations. Interested in exposing your student to the wonders of a musical education, or supplementing his/her musical training with the interdisciplinary guidance of a skilled co-educator? Rainbow Tutoring offers personalized one-on-one or semi private music theory, music composition, basic music recording and audio engineering, songwriting, and piano training for students of all ages and levels. Contact our office at rainbowtutoringoffice@gmail.com or 310.902.7912 to learn more about how you can help your student reap the benefits of musical mastery. As always, you can join the conversation on our Facebook Page, Twitter, and in the comments section below!